We’re about to convince you to change your dinner plans for tonight. 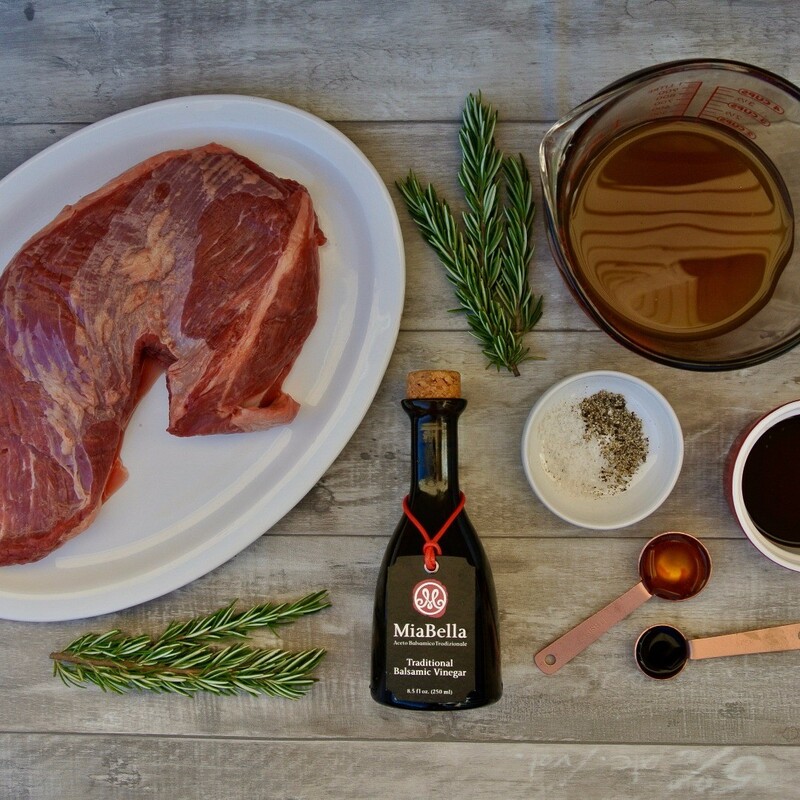 Seriously this balsamic rosemary beef is so simple, and so flavorful you’ll want to drive to the store right now. We absolutely love this recipe. It’s so easy with hardly any prep work, you really just sear off a hunk of meat in a Dutch Oven, add liquid, throw it the oven, and then forget about it. Plus it’s the meal that keeps on giving! On the day we make it we like to serve it with a vegetable side dish, or polenta if we’re really feeling the comfort food mood. Then through the week we’ll use the leftovers in pastas and sandwiches. 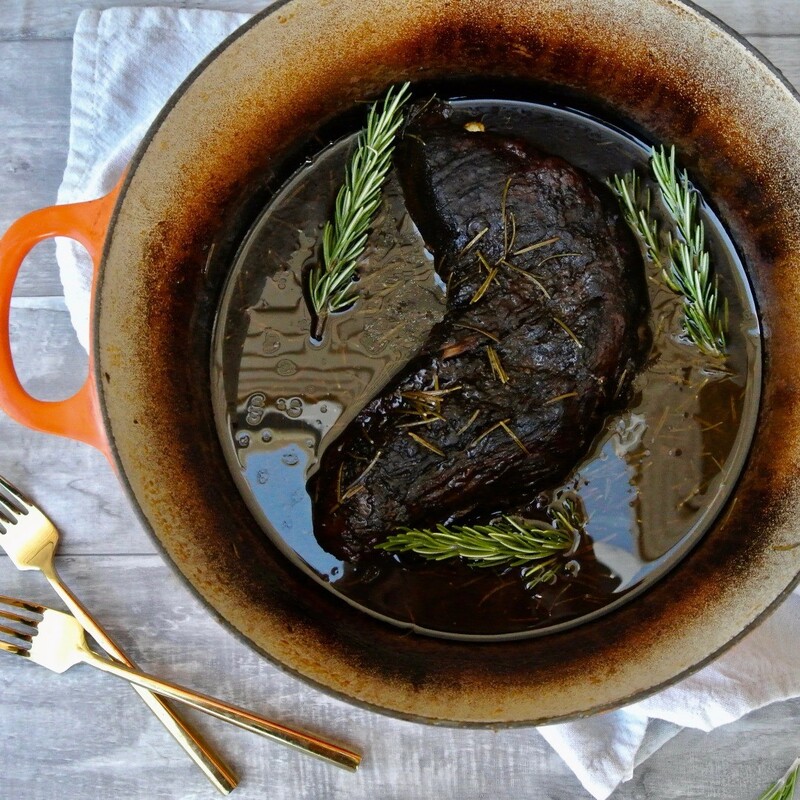 This Balsamic Rosemary Beef recipe is perfect for cozy family dinners or all day Sunday football couch fest. It’s the kind of dish that warms up the whole house and tastes like a hug on a plate. We also love to whip this recipe out for Holiday Dinners. First, because it’s an easy (and we really mean easy) dish that doesn’t destroy your kitchen, which is good because you have guests to talk to and wine to drink. And second, this balsamic beef is really good at room temp. Which means we can just forget about all of the panicking that happens when 5 different dishes are supposed to be in the oven all at once and you have a two minute window where all of the hot dishes are actually hot at the same time. We’ve all been there. It’s not a good place. You can just let this baby hang out on the sidelines while you finish your sides off, dress your salad, and pour more wine. We call that a win-win. Pat the meat dry with paper towel and generously sprinkle the meat with MiaBella Fleur De Sel and pepper. Place your Dutch oven over medium-high heat and add the olive oil. Heat until the pot is very hot and the olive oil almost reaches the smoking point Add the meat and brown for about 5-7 minutes on each side until a nice brown crust forms. Add the broth, MiaBella Traditional Balsamic Vinegar, soy sauce, and Worcestershire sauce. 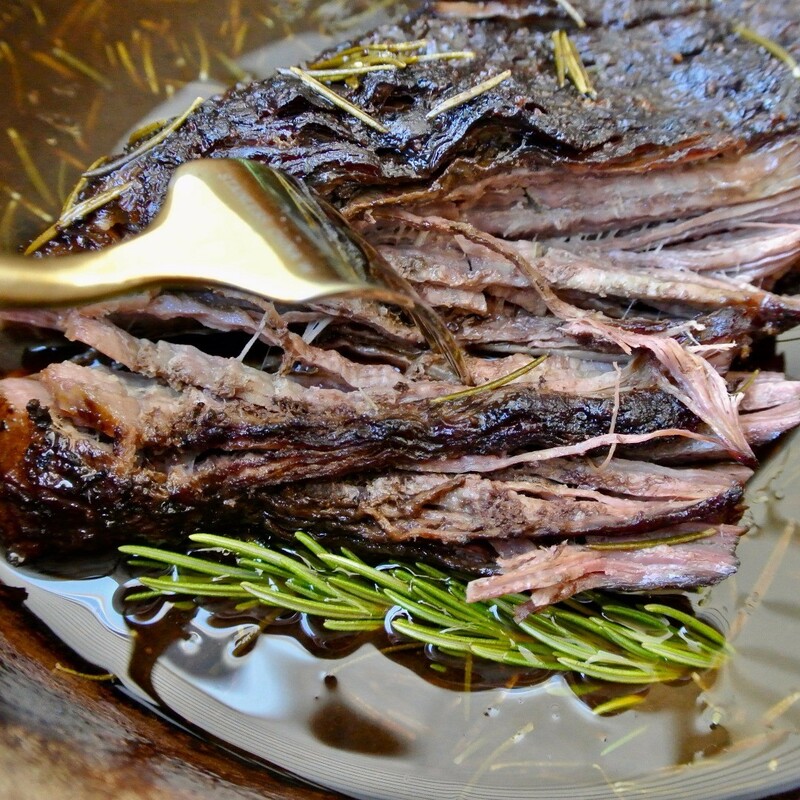 Place the rosemary sprigs around the meat. The liquid should cover the roast at least half way up the side. If the liquid level is too low, add more broth. Remove the dutch oven and allow to cool a bit. Shred the meat with a fork or you can slice into 1/2 inch slices. Garnish with fresh rosemary and serve!